A commission for a riverside apartment in Greenwich. We wanted cool English water and green lands meeting the spice of India. December 2015 - "My name is Dr. Shefali Gupta and the interior designer Julie Kent suggested my husband and I look at the work of Emma Rose to enhance the refurbishment of our Greenwich Town House. Having studied her website in 2014 we were enchanted by her extraordinary use of colour, and the talent to produce abstract, semi-abstract and figurative work. 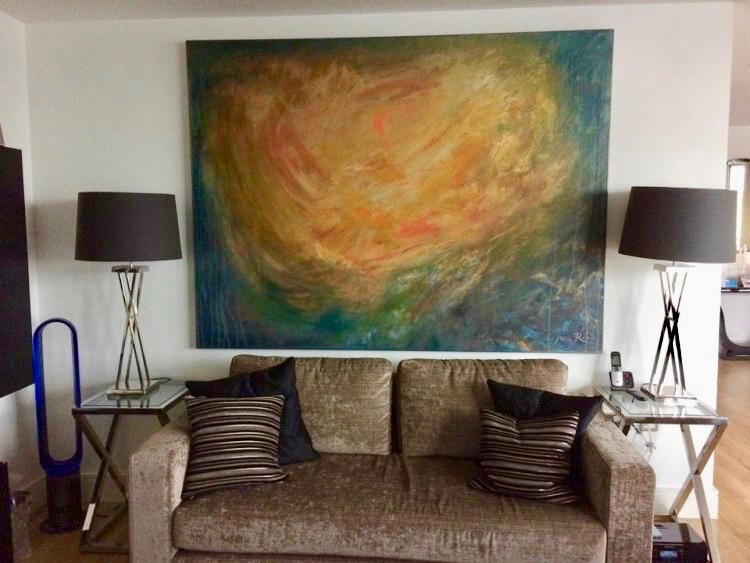 Over a year of helpful conversations and email correspondence we commissioned a very large painting from Emma - 150x200cm. (the process from our side was inturrupted by a birth!). So confident were we in her vision, we merely stated the colours we would like to use - no subject matter. Once we went firm on the commission she was most efficient - keeping us up to speed on the purchase of a huge bespoke canvas, the developing painting and then organising the transport to London. This all happened in a very short timescale. When the creation arrived we were full of joy. She has managed to create a symbolic abstract painting that involved our own personal journey, through heritage and creation - entirely personal and unique. The extraordinary thing is that we never actually met her! However we feel entirely comfortable and like old friends. I would highly recommend Emma to you, and will definitely be commissioning a second painting from her very soon. We are now planning a trip down to Bath to meet her. She has kindly and diligently recommended a variety of hotels and restaurants and activites for our trip. Lucky Bath."